Strand Paper & Board is one of the UK’s leading, privately owned independent speciality paper merchant. 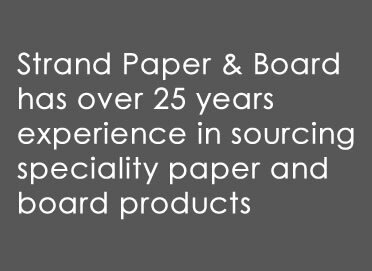 Established in 1989, The Company is actively involved in supplying paper & board to a number of speciality markets including: Greeting Cards, Envelope Conversion, Premium/Luxury Packaging, Metallised Paper & Board and Greyboard applications. In addition to this we stock a number of market leading products including Algro Design, Chromocard HB, Mont Blanc White, Eskaboard, Valvac M1F and Speypack Eco. Please use our website to find our latest product information and request samples.